The Water Warriors Thresher is a new pump-action water blaster by Alex Brands Buzz Bee Toys Holdings for 2016.The Thresher appears to use the same pump-action mechanism as is found in older Water Warriors models such as the Water Warriors Gargoyle (2013) and Water Warriors Hydro Blast (2008). The Thresher is closest in terms of function and design to the Gargoyle (2013), but the Thresher features a slightly larger reservoir capacity, though slightly lower measured pump volume. As ony may expect by looking at this water blaster, the blue region is the reservoir that is accessed and filled via a small, sometimes tricky to open snap cap. The forward yellow section is the pump and it moves freely along the pumping mechanism contained within. While there is a grip on the back-side of the blaster for holding, there is no additional fake trigger piece. Aimed at younger users, the Water Warriors Thresher's light weight, simple operation, and high capacity-to-output ratio means users can blast away and not need to refill as frequently. While each blast is not particularly drenching, it offers enough water to keep blasting many, many pumps on. 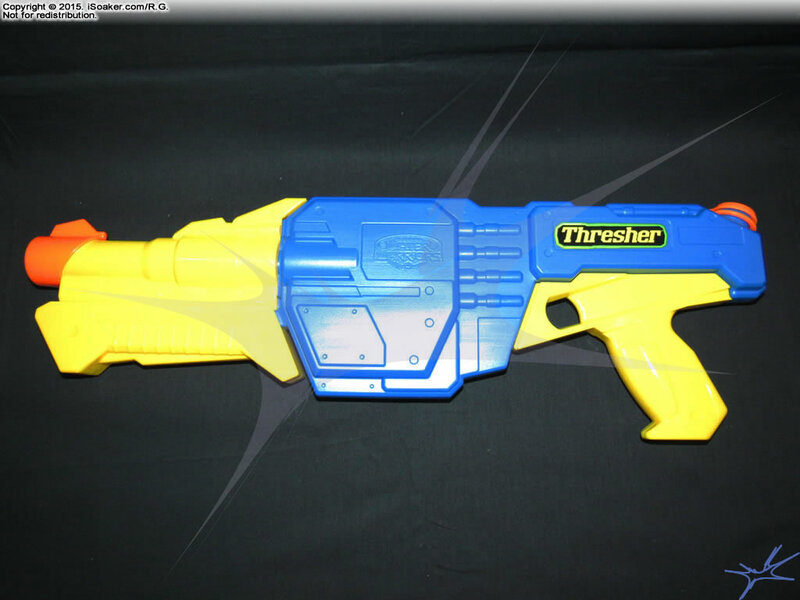 Good for casual, light skirmishes, the Thresher is readily outclassed by almost any larger pump-action water blaster and definitely avoid going head-on against most pressurized water blasters. Nice styling, clean lines, decent build. 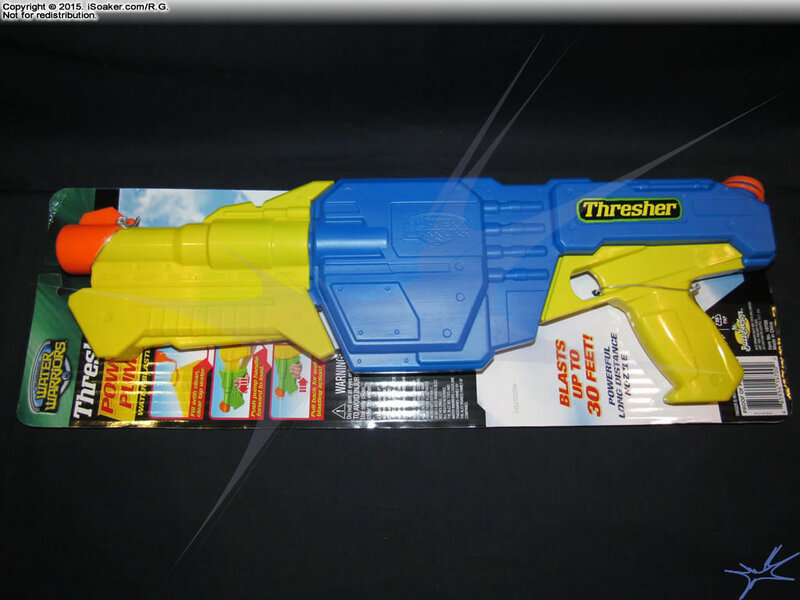 Good capacity and decent output for this light-class water blaster. Piston-based; needs both hands to operate; continuous streams not possible. Snap-cap closure do not seal as tightly as screw-on caps.